Kitchen Boss: Best. Cooking. Show. Ever. I love Buddy Valastro! 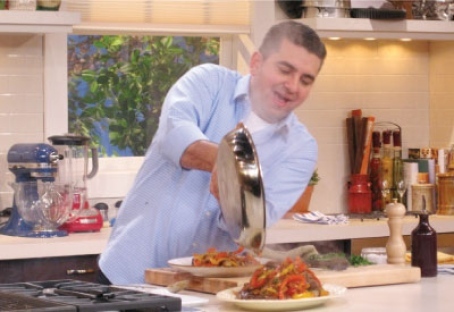 I watch him on Cake Boss whenever its on and I was curious to find out what the lovable master baker from Hoboken has up his sleeve in his very own kitchen (its a studio kitchen but who cares?) with his fare of Italian cooking. 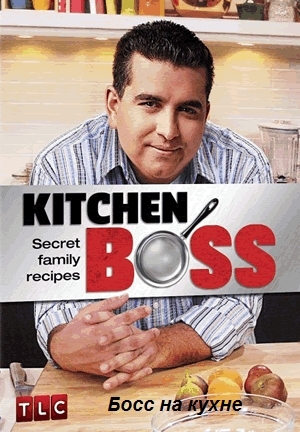 After watching two episodes of Kitchen Boss, his spin off show, also on the TLC network, I have no doubt in my mind that it is the best cooking show ever. Why? Simple. Because Buddy makes cooking fun. Buddy loves to bake, and Buddy also loves to cook. It’s obvious that he has a very intimate relationship with flavors, butter and loads of olive oil and way he talks about food is absolutely entertaining. He talks to his audience the way he would talk to a houseguest and not only outlines his recipes but also adds from which side of the family the recipe comes from, and what makes the dish so special. He is so familiar with kitchen which makes for a very relaxed vibe. His ingredients are not measured in cups, making the tasks seem simple rather than complicated compared to other shows where each step is measured. CHECK OUT THAT GRIN. Buddy’s enjoyment for food is obvious by the way the smile never leaves his face while he shares his favorite family recipes. Buddy makes his show personal and the magic is really the marriage of his love for food and his gift of gab. There is really no dead air on this show, even when Buddy has pasta on his mouth. I love this guy. He is just so animated all the time and that is a good thing for a cooking show because there are just so many chefs out there with their own cooking shows with different gimmicks. Buddy makes his show stand out just by being himself. Of course, Buddy’s show is never complete without an occasional visit from his familia, some of whom we are already familiar with from his Carlo’s Bakery, and the ease and comfort that he has in interacting with his family is also a great watch. Buddy is a star and I feel like he’s my friend, and while most of his dishes include a lot of cholesterol, he makes me want to try them out just to see whether I can do his family recipes justice too. If there is still any doubt left in your mind, I think Kitchen Boss is awesome. To more seasons of Buddy! You really make it appear so easy along with your presentation however I to find this topic to be really one thing that I believe I might never understand. It kind of feels too complex and very wide for me. I am taking a look ahead to your next publish, I’ll try to get the grasp of it!